Have you seen the movie King Kong or Mighty Joe Young? Huge and powerful gorillas who were very well behaved when with their blonde female friend and wrecking havoc in the company of others. Silverback projects are similarly huge and powerful. A Silverback project is characterised by a combination of or ALL of: being complex in terms of scope, having a very high-profile and a high budget, and having several small projects and project groups dependent on one another. 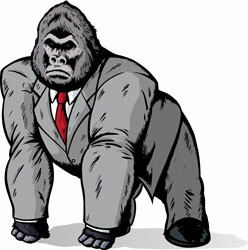 ALL large, complicated projects are Silverbacks by default! Start with this mindset and you will be primed to pick up the pieces and troubleshoot as soon as you join the project. What Happens With Silverback Gorillas? Silverback gorillas are projects that seem harmless but then end up causing a lot of problems because is usually more complex than anticipated, the budget is insufficient, the necessary people needed to complete the project will not be available as it had not been planned that they were required and so on. Its because the scope and resultant impact and issues with the seemingly easy project are not anticipated that they can cause such a mess. 4) Call a halt to any work beginning or about to begin that is not of a defined scope or delivery plan. If you are working against a budget, why burn money when it hasn't been conclusively decided what the end product or result is going to be? 6) Call a meeting of ALL key stakeholders (at the very least, the big decision makers/backers of the project) and map out all of your concerns. Highlight the knowledge gaps that need to be plugged so that a more accurate delivery schedule can be provided and mapped to resource plans. Highlight the likely costs against any pre-agreed budgets, and also give guidance as to best practices and how the project should be run for least pain. In short, GET EVERYTHING OUT IN THE OPEN so that the project team are all on the same page and honest decisions can be made. Forewarned, forearmed. Check useful tools for managing your projects.